New from Hornet Products. This is a Match-Grade Fluted Blued Steel Target Barrel, CNC machined, and button rifled with a 1-16" twist rate. Chambered for 22 LR, and 22 High Velocity LR. These barrels are tight fitting and cut to "Bentz" specifications for consistent accuracy and cartridge extraction. Brushed blued steel satin finish. CNC machined and stress relieved. Dimensions: 20" Length x .920" Barrel Diameter. Requires use of a heavy barrel stock (available separately). Green Mountain has a devoted following by discriminating target shooters and it is well deserved. 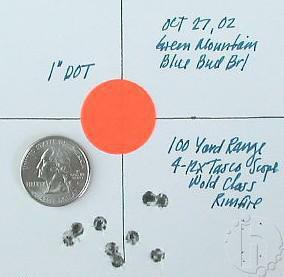 See sample test target below for accuracy results for a Green Mountan blued bull barrel. Note: The 1" Red Dot is used for aiming the scope on a fixed point.